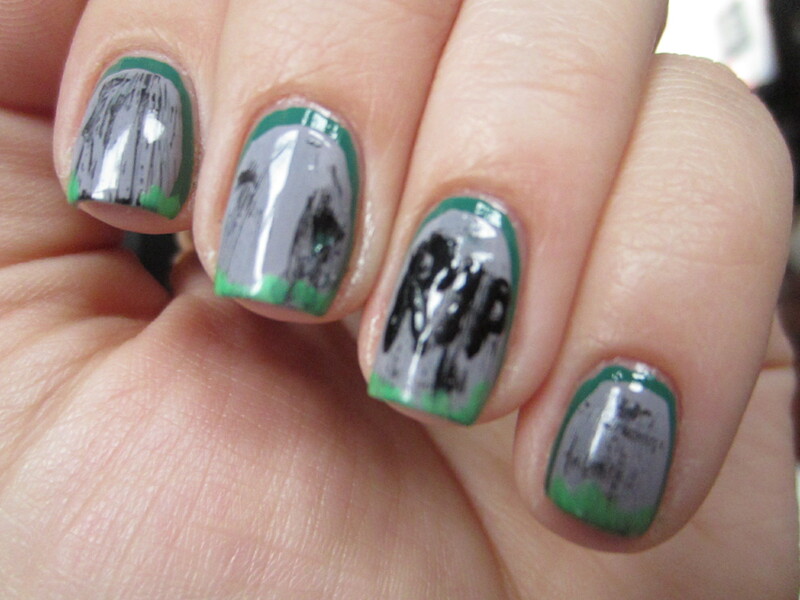 This is Halloween Nail Art Challenge: Graveyards! Can you believe I just have 2 more days after today?? This challenged seemed to fly by for me! 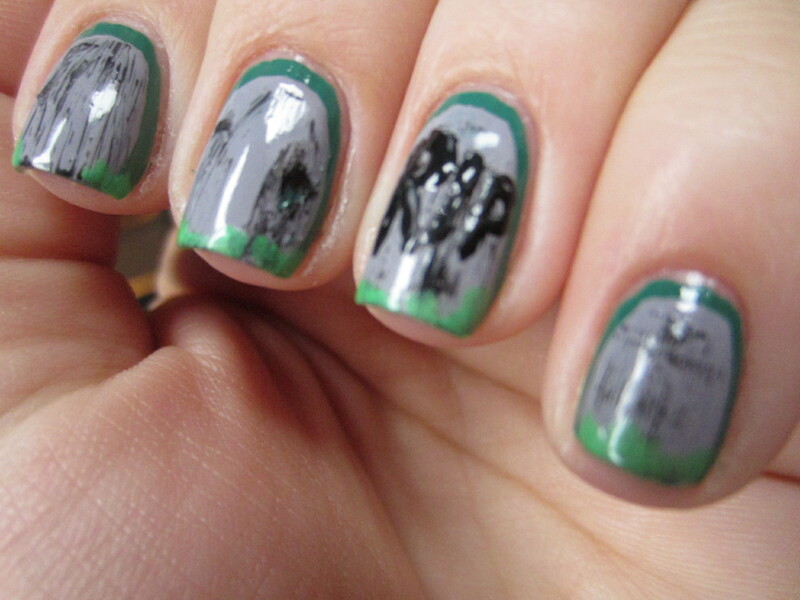 But we are just 2 days away from Halloween and today’s challenge was nail art centered around Graveyards. So I decided to try a manicure that I’ve wanted to try for a very long time, a Ruffian manicure!! NOTE: I majorly broke ANOTHER nail this morning! I am drawing your attention to this for 2 reasons. 1.) This time its a break on my swatching hand. I wish to take a moment of silence for my pinky nail. I tried to file down my nails as short as I was comfortable with, but whenever I break a nail it seems to always go really low. 2.) These Halloween nail art pictures are new, but I have older swatches that I have yet to post. So while you’ll see a nubbin pinky finger in these pictures, you’ll see normal nails in other swatches for a while. Also, sorry the ring finger with the most detail is out of focus! I guess this is the post where I’m going to explain myself a ton! Hurricane Sandy and this Northern storm that hit it has been wrecking havoc where I live since Friday. Thursday was in the 70s and sunny and its been in the 40s and a downpour with high winds for the last 4 days. So I didn’t have any light to take pictures of my manicures. My prayers go out to all of those who are in a more direct path of Sandy than I am, New York City, Washington, Rhode Island, Philly, or other areas on the northern east coast. I hope you all are safe and warm and although I know there are major power outages already, I hope you and your families don’t experience heartache or damage. This manicure better not be any foreshadowing to anyone reading this post! For all of you who don’t know what a Ruffian manicure is, its kind of like a manicure on top of another manicure. You paint your nails with a base color, and then paint your nails with another color over top, leaving room around the cuticles. I didn’t do a TRUE Ruffian, because a true Ruffian wouldn’t leave any of the base color around the edges of the nail, just near the base. But I wanted these to look more like tomb stones so I left a little room. Zoya “Raven”: black with a subtle silver shimmer, I scrapped off the brush as much as I could and then lightly dragged the brush across the grey to give it a weathered/aged look. I also dipped a toothpick in the bottle and wrote R.I.P. on my ring finger. What do you guys think? Are any of you going through the hell that is Sandy right now? My prayers go out to you and your family if you are. Have any of you tried a Ruffian manicure? What are your favorite combinations? 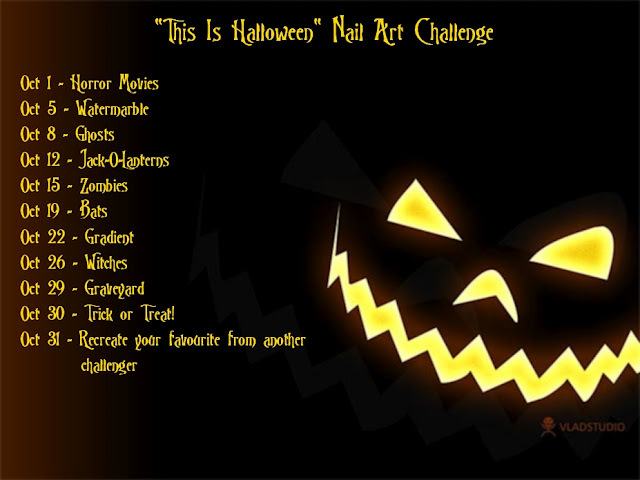 “This is Halloween” Nail Art Challenge! ← OPI Euro Centrale Collection Preview!